Now here’s a find, picked up for a tenner out of the vinyl racks at Ray’s Jazz Shop in Soho yesterday. 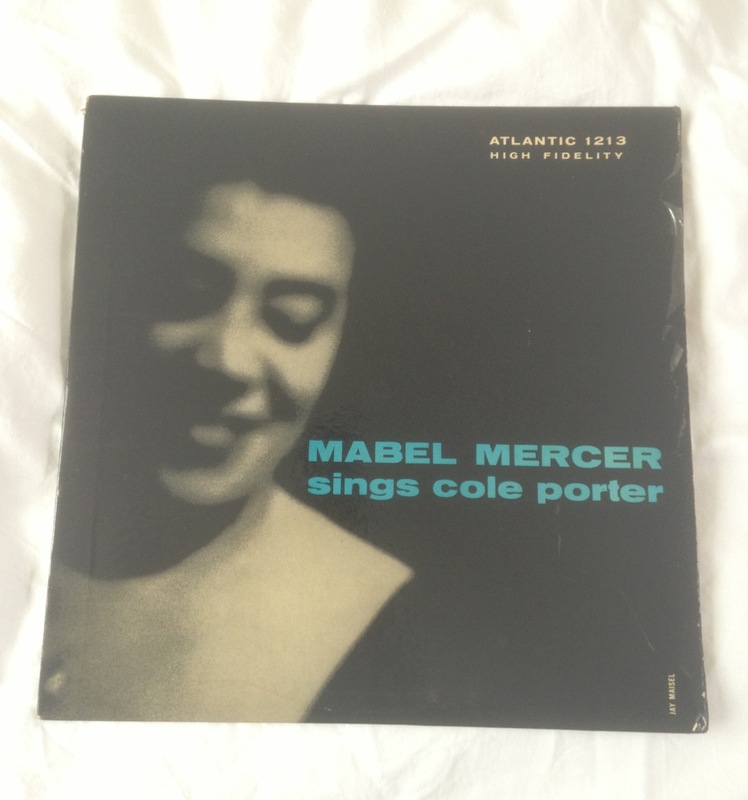 I’m no longer a vinyl hound, but I couldn’t resist this well-preserved original US Atlantic copy of an album by a singer who influenced Billie Holiday and Frank Sinatra, with its elegant typography and an artfully out-of-focus photograph by Jay Maisel, who shot the cover of Miles Davis’s Kind of Blue. By the time I saw Mabel Mercer, she was in her early seventies and performing from an ornate armchair to audiences at the St Regis Hotel in New York City, in a room that held around 75 people. She was giving two shows a night on Tuesdays, Wednesdays and Thursdays, and three on Fridays and Saturdays, with Sundays and Mondays off, and she was filling the place. At each show she performed around two dozen songs with her long-time accompanist, Jimmy Lyon, at the grand piano. She could no longer sing. Instead she more or less talked her way through her repertoire, which was based on the classic American songbook: the theatre songs of Gershwin, Rodgers and Hart, Jerome Kern and so on, sprinkled with more recherche items from the likes of Alec Wilder or Cy Coleman, sometimes written specially for her. But in the way she spoke the lyrics, in the understated dramatic precision of her phrasing, you could easily see why other singers admired her so much. Strangely enough, the woman who came to epitomise the civilised entertainment to be found in Manhattan’s mid-century supper clubs was born in Burton upon Trent, the daughter of a white English music-hall artist and a black American who is sometimes referred to as a jazz musician — although, since we are talking about the year 1900, that description might have been slightly premature. At any rate, she never knew him, and she was still a child when her mother and stepfather left for the United States, leaving her to board at a Manchester convent, where her colouring and short, dark hair led her fellow pupils to nickname her “Golliwog”. At 14 she left to join her aunt’s song-and-dance troupe, beginning a career in show business that took her to London in the 20s, to Paris in the 30s, to the Bahamas in the early 40s, and eventually to New York, where she settled. In each of those cities, her audiences included the A-list celebrities of the day: film and theatre people, literary stars, fellow musicians, royalty. But it was in New York that she found her niche and secured a recording contract with Atlantic Records; here’s an example of this remarkable artist in her prime, singing “Les Feuilles Mortes” on one of her earlier albums, produced by the label’s founders, Ahmet Ertegun and Herb Abramson. She usually performed solo but Whitney Balliett, the New Yorker‘s nonpareil jazz critic, saw her share the Philharmonic Hall stage with Stan Getz during the Newport Jazz Festival in 1973 and remarked that she induced the saxophonist to play “in a hymnlike manner he hasn’t shown in years”. There’s a black and white clip of her, a year later, performing Lerner and Lane’s “Wait ‘Til We’re 65” and Sondheim’s “Send in the Clowns” at a benefit concert. She appeared twice at Carnegie Hall in the mid-70s with the great cabaret singer Bobby Short, a musical soul-mate, and in 1983, the year before her death, she travelled to the White House to receive the Presidential Medal of Freedom from Ronald Reagan. Alec Wilder, contributing a sleeve note to The Art of Mabel Mercer, released by Atlantic in 1965, described the human variety to be found among those who came to listen to her: “From pompous executives to wild-eyed hepcats; from fragile Victorian spinsters to bumptious banner-bearing avant-gardists; from graphologists to trumpet-players; from Back Bay to Broadway; from conservative to radical — behaving with respectful quiet in the presence of Mabel’s songs.” There’s isn’t much of an audience any more for what she did. A fair proportion of those following the links above will probably find her care for diction alone hopelessly old-fashioned. They should listen to her languid, lustrous version of Cole Porter’s “So in Love”, recorded in 1954: if it was good enough for Lady Day and Ol’ Blue Eyes, it’s good enough for me. I much appreciated this piece as I knew nothing about Mabel Mercer.